The job of the semispinalis muscle group is to extend your head, neck and upper back. It also rotates (think twist or turn) these structures to the side opposite (of the spinal column) to which it is located. Because the semispinalis is comprised of 3 separate muscles, things get more specific. Let's drill down to learn more. The semispinalis thoracis is the first and most superficial layer of the semispinalis muscle group. Superficial, in this case, refers to the muscle whose location is closest to the top - relative to the other muscles in the group, that is. The semispinalis thoracis arises from the transverse process of the lower thoracic vertebrae. It attaches onto the spinous process of the uppermost 4 thoracic vertebrae and the lower 2 cervical vertebrae. Remember from the short discussion above that the spinous process is a projection of bone emanating from the back of each vertebrae. In fact, you may be able to actually touch the tips of your spinous processes, as on many people, they are prominent. It is the job of the semispinalis thoracis to extend your spine, as well as to rotate it towards the side of your body that is opposite from this muscle. For example, if you turn to look over your right shoulder while parallel parking, you'll likely be involving the semispinalis thoracis that is located on the left side of your spine. The semispinalis cervicis starts, or originates from, the transverse processes of your upper 5 or 6 thoracic vertebrae plus the articular processes of the 4th to 7th cervical vertebrae. An articular process is a small projection of bone arising from the back of the vertebra that connects with a similar process from the vertebra either directly above or below. In all, you have 4 articular processes per spinal bone. These articular processes make up the facet joints. 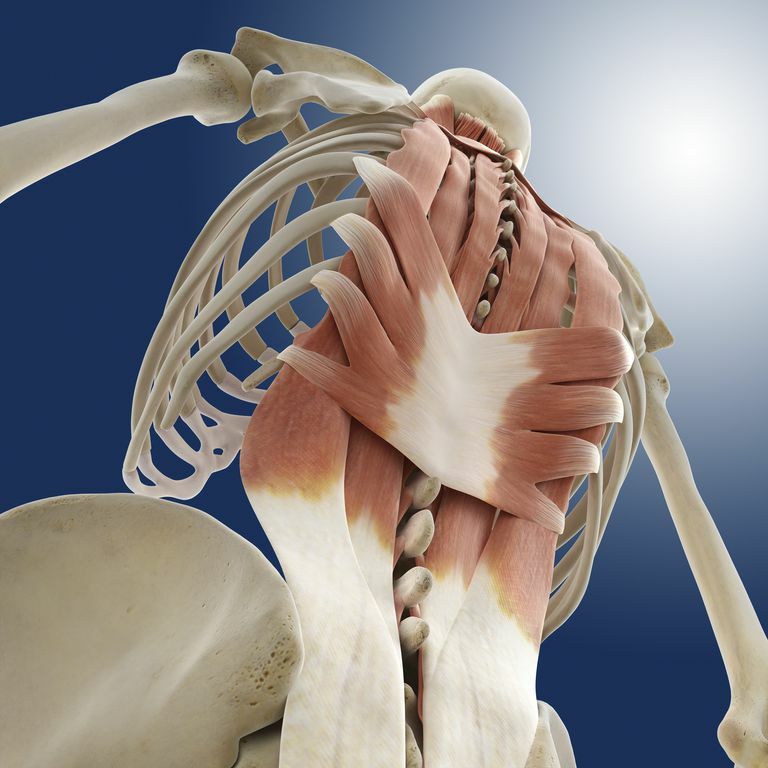 The other end of this muscle attaches onto the spinous process of the 2nd through 5th cervical vertebrae. When the semispinalis cervicis muscle contracts, it extends, and even hyperextends your neck (cervical spine.) If just one side is contracting, this results in lateral flexion of the neck. You might think of lateral flexion as tilting your head to one side. Authors of a 2005 anatomy study (Takeuchi, et. al. Anatomic study of the semispinalis cervicis for reattachment during laminoplasty.) state that in some types of laminoplasty surgery, the semispinalis cervicis may be slow to heal. The semispinalis capitis arises, or originates, from the tips of the transverse processes of the upper 6 or 7 thoracic spine, as well as the articular (remember these are the processes that make up the facet joints) of the 4th, 5th and 6th cervical vertebrae. The muscle travels to the occipital bone where it attaches between the superior and the inferior nuchal lines there. The job of the semispinalis capitis is to extend and tilt (lateral flexion) the head to the same side on which the muscle is located, and to rotate (twist or turn) it to the opposite side. The semispinalis capitis works with the splenius muscle group and the semispinalis cervicis to perform its functions. Semispinalis Thoracis. Wheeless' Textbook of Orthopaedics. Duke Orthopaedics. http://www.wheelessonline.com/ortho/semispinalis_thoracis. Accessed Oct 2014. Why Is the Multifidus Muscle Special? What Does Your Latissimus Dorsi Do? Lateral Recess — What is It and Why Should You Care?